Motor yacht Maisha is a 38m (125ft) explorer yacht built by Cobra Yachting, Turkey, in 2008. 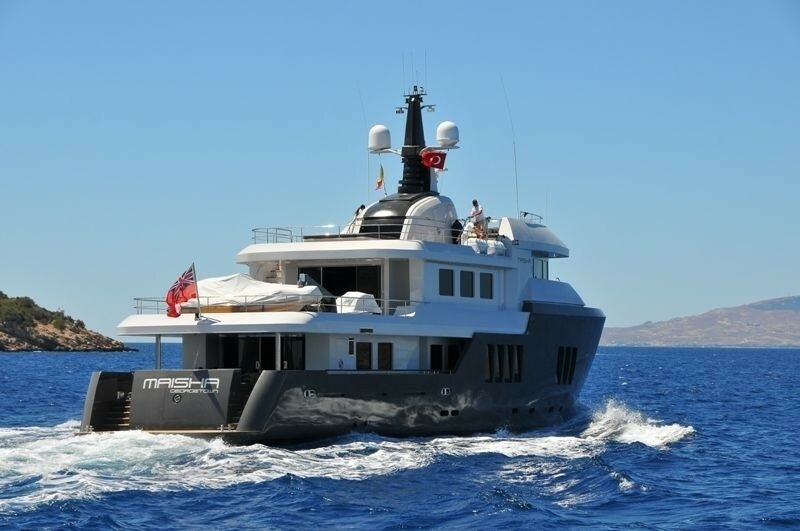 M/Y MAISHA was designed by Ava Yacht Design Co. Ltd. and Scaro Design. Her interior design by Dara Kirmizitoprak, Turkey, is dedicated to symmetry, with minimalism in mind and an earth-tone palette. 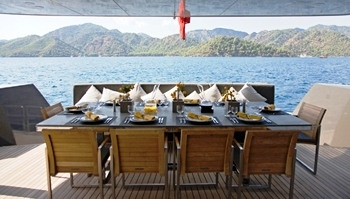 Motor yacht MAISHA is able to accommodate 8 guests and 7 crew members. 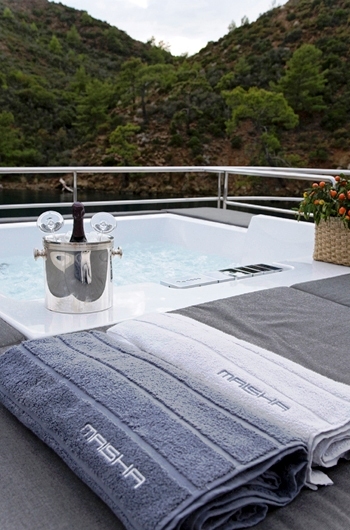 Luxury motor yacht Maisha boasts and upper and lower salon. The main salons lounging area features two white couches, and chrome chairs and a 42-inch Plasma television and Harman Kardon sound system. Further forward and adjoining the main salon is the formal dining area. 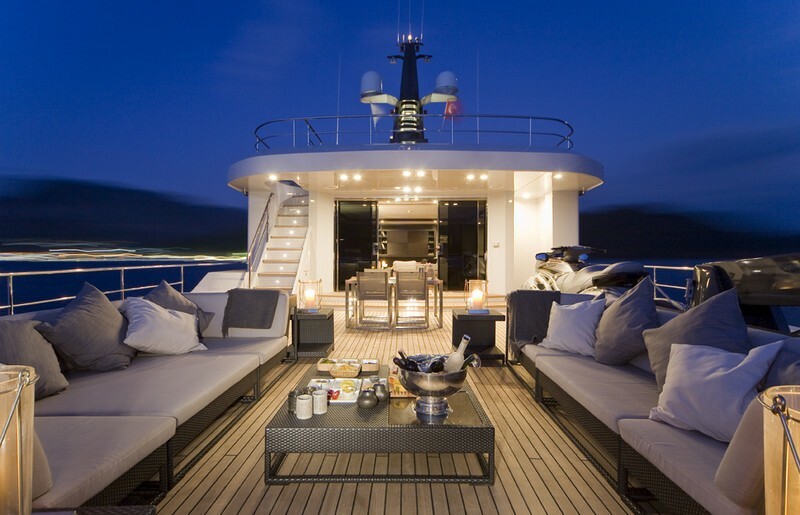 The main deck flooring features mahogany parquet imported from the United States. The floor has one stripe of darker mahogany that runs along the length of the salon, in keeping with the striped floor theme throughout the vessel. 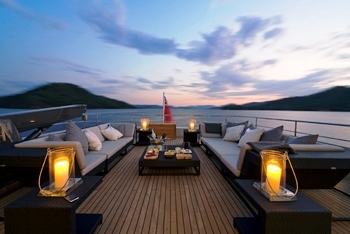 Sliding doors from Motor yacht MAISHA’s main salon lead to the main entrance with stairs that lead to the upper salon or down to the guest cabins. The sky lounge or upper salon also boasts beautiful mahogany parquet floors, white couches and chairs, and dark blinds. There is another television in this upper salon which can be hidden by a sliding door. 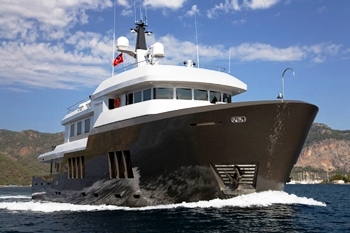 Motor yacht MAISHA is able to accommodate up to 8 guests in 4 cabins. Her master stateroom is on main deck forward with a very large en-suite bathroom with a large double shower room with American shower and his and her heads. 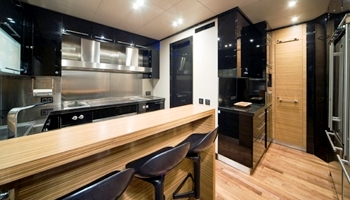 The Master cabin features a King sized bed, a desk, a 100cm flat screen TV with separate satellite signal & DVD player. There is ample storage in the many closest as well as a safe. The cabin has floor to ceiling windows providing plenty of natural light and the color scheme is ivory and dark brown with large lamps and two ivory cushioned chairs. The VIP stateroom is on the lower deck aft and is full width of the beam. 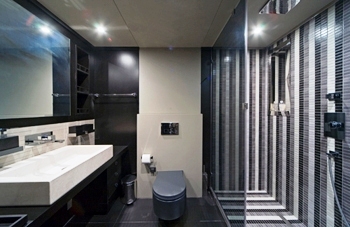 The VIP Cabin features an en-suite shower room with an American shower and a separate toilet. There is a King sized bed, a Sofa for 2 and an 80cm flat screen TV with separate satellite signal & DVD player. The V.I.P. cabin is designed in brown, ivory, and light green shades. With ivory walls, the cabin is brighter than the others and features a brown fabric couch with light green and ivory pillows, pen and ink drawings on the walls, and dark brown furniture. Behind the bed is a headboard, and on each side of the bed are two large modern lamps and dark brown bureaus. 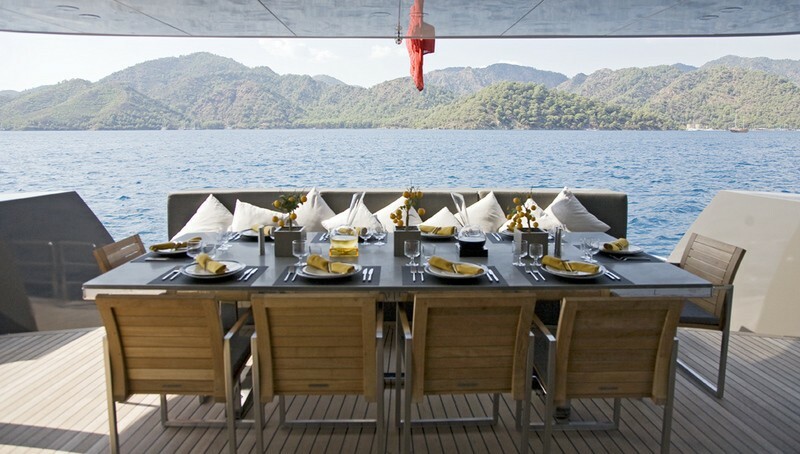 Explorer motor yacht MAISHA has great external areas. 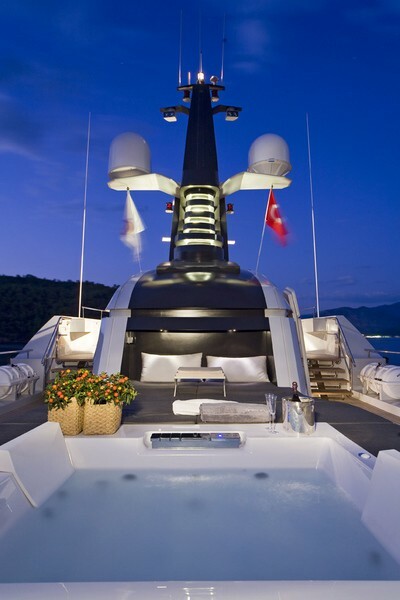 Her upper deck is ideal for relaxing with a large lounge area and when not in use it doubles as a storage area for the tenders and jet skis. The sun deck features two removable umbrellas, a Spa Pool, toilet, shower, and a sauna that can accommodate all eight guests. A small bar area allows for quick food and cold drink service from the refrigerator. 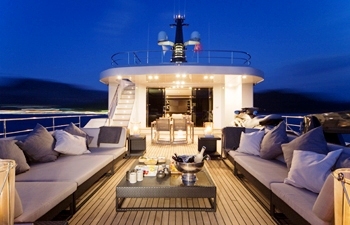 M/Y MAISHA’s aft deck contains a gray marble and chrome dining table which can seat 12 guests, wooden chairs with slate gray cushions, and a large slate gray couch. 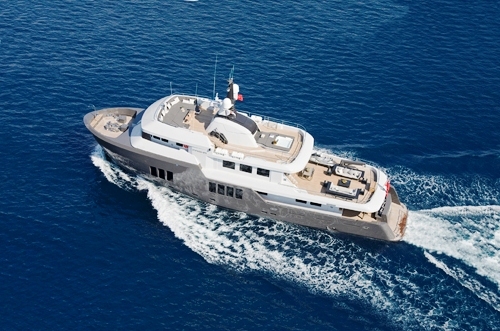 The modern wheelhouse has a consol and seating covered in black leather, with the ceilings adorned in gray leather. 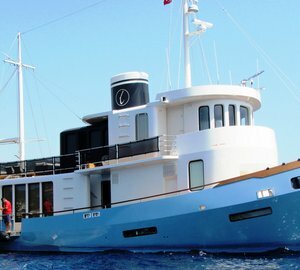 The wheelhouse is spacious enough to include a couch attached to the back wall, where guests can watch the captain navigate. 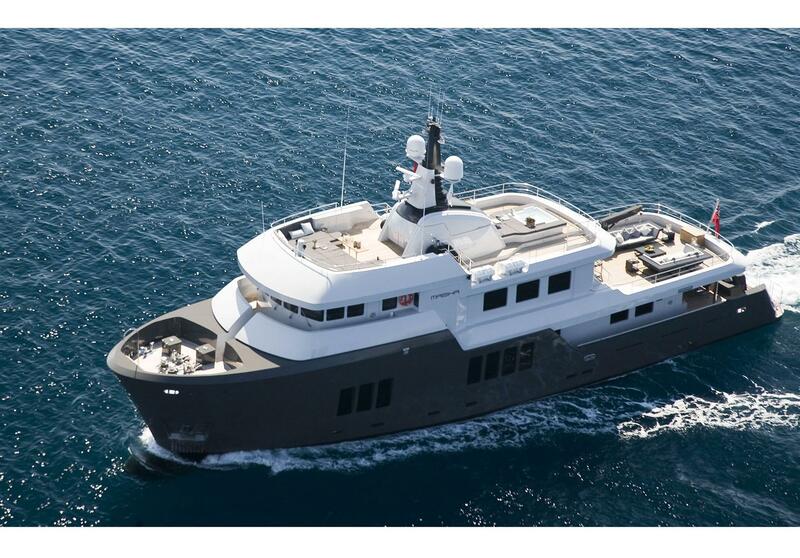 Motor yacht MAISHA cruises at 12 knots and can reach a maximum speed of 14 knots. 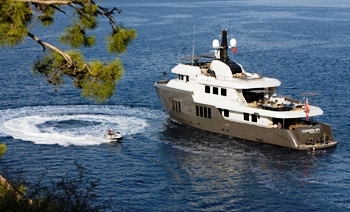 Motor yacht MAISHA is able to accommodate up to 8 guests in 4 cabins. Her master stateroom is on main deck forward with a very large en-suite bathroom with a large double shower room with American shower and his and her heads. The VIP stateroom is on the lower deck aft and is full width of the beam and has an en-suite shower room with an American shower and a separate toilet. 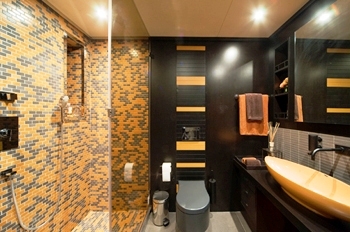 The remaining guest cabins are located to port and starboard on the lower deck and each feature an en-suite shower room with an American shower. One of the cabins features a Queen bed while the other has a twin bed configuration. Expedition yacht MAISHA has the following extras onboard: Hi Fi music system in all cabins, 2 salons, and all decks, DVD & Satellite Television in all cabins & salons, 8 Extra large SAMSUNG LCD HD TV screens, Wi-Fi internet system in all areas, Sauna, shower and day head located on the fly bridge (located inside the funnel), Spa Pool with large sunbathing pads aft on the flybridge, 2 Sunbathing areas, Upper deck external salon & umbrellas. Communication & internet by satellite VSAT - Seatel Satellite antenna television system - 2 portable GMDSS VHF - 4 portable VHF - MF HF SSB - Navtex NAV7. Tenders and plenty of toys. Please contract CharterWorld or a full list.